The blog about wines that taste like a million bucks but cost a whole lot less. ← RECOMMENDED: 2010 Cryptic, California red blend. 14.5% ABV, $18 SRT; available for less. 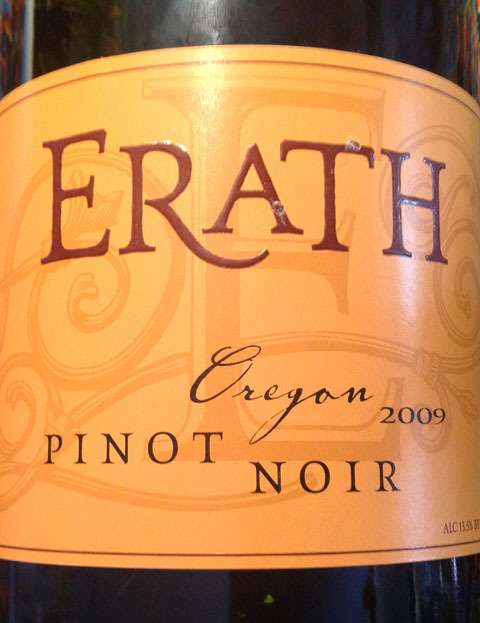 RECOMMENDED: Erath 2009 Pinot Noir. 13.5% ABV, around $15. Medium ruby. Nose of cherries, strawberry. First impression: a little hot, bright fruit, spicy at mid-palate with nutmeg. Softened as it opened up with cherry and raspberry added; could be the “hot” impression came from new oak. A good Oregon Pinot Noir at an excellent price point. Softened further as it opened up; truly a good value. LABEL: Grapes from the EARTH, wines from the HEART … ERATH. This soft and approachable Oregon Pinot Noir appeals to red and white wine lovers alike. Crafted to highlight Pinot’s best characteristics, enjoy it on its own or discover how well it pairs with a wide variety of foods, from fish to pasta to red meat. This entry was posted in Oregon, Pinot Noir. Bookmark the permalink.